Sangyum Rigdzin Wangmo (Tib. gsang yum rig ‘dzin dbang mo) aka Dudjom Sangyum Kusho Rigdzin Wangmo (Tib. bdud 'joms gsang yum sku shog rig 'dzin dbang mo) married Dudjom Rinpoche while they were still in Tibet. She was the mother of Dekyong Yeshe Wangmo, Chimey Wangmo (their second eldest daughter), Shenphen Dawa Rinpoche and Tsering Penzom, their younger daughter. Sangyum Rigzin Wangmo spent many years in strict retreat and was considered a true hidden dakini. She passed away on 27 August 2014 at the Yeshe Nyingpo center in New York City. 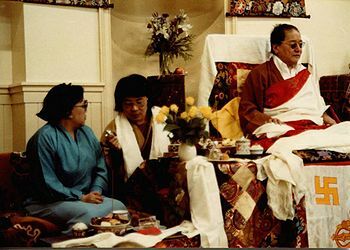 from left to right: Sangyum Rigdzin Wangmo, Sogyal Rinpoche and Dudjom Rinpoche. 1979, St Marks Hall, London, UK. Dudjom Sangyum Kusho, Rigzin Wangmo, [...] was one of the greatest dakinis I have ever known and the sangyum of Kyabjé Dudjom Rinpoche, my beloved master, of whom I spoke at length in The Tibetan Book of Living and Dying. She played such an important role in Dudjom Rinpoche’s life. With her extraordinary love, care and magnetism, she lengthened his life and was able somehow to make him stay amongst us. Theirs was an enchanting relationship. Not only did she give him great spiritual support, and inspire an aura of completeness around them, but on a human level she created an incredible atmosphere of warmth and of family. Often Sangyum Kusho would have visions in which dakinis would appear and grant prophecies that would lengthen Dudjom Rinpoche’s life. When I used to request him for a divination, he would tell me to ask Sangyum Kusho, and said she was better than him at divinations. It was thanks to one of her predictions that Kyabjé Trulshik Rinpoche was able to avert an obstacle to his life, and many are the occasions when she has given me prophecies, and warned me of potential hazards. In fact she was like a guardian angel for me, kind, generous, and always praying for my long life and for Khandro Tsering Chödrön and my mother, or giving us guidance and divinations.[...] Sangyum Kusho was a refuge to us all. Sangyum Rigdzin Wangmo was recognized as a manifestation of White Tara and of Yeshe Tsogyal. She was the predicted and prophesied consort for Dudjom Rinpoche. He received this divine prophecy from the dakinis when my mother was just eight years old. At the same time, at that young age, my mother received dakini teachings from Yeshe Tsogyal which she immediately put into practice. Their meeting was arranged by Dudjom Rinpoche’s Dharma Protectors, Shenpa. Shenpa appeared to my mother’s father indicating the prophecy for her to marry His Holiness. Shenpa simultaneously appeared to His Holiness indicating when the meeting would occur. 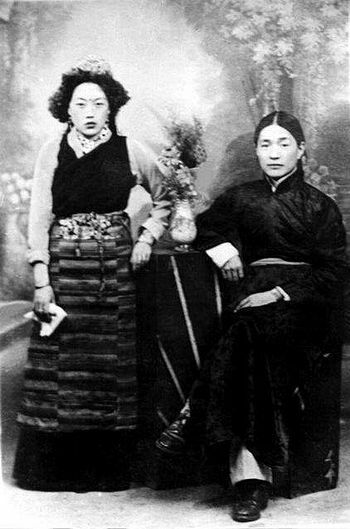 Rinpoche married her in Tibet while she was still in her teens. An interesting historical parallel is that, again as a manifestation of Tara, she was the consort of Dudjom Lingpa, His Holiness’s previous incarnation. In that life, she took her very body to the buddhafield. One day when Dudjom Lingpa returned, she had already gone, with no trace. The union of Dudjom Rinpoche and Sangyum Rigdzin Wangmo produced one son and three daughters. The eldest daughter, Dekyong Yeshe Wangmo, dissolved her body into space at a very young age. His Holiness recognized her as a Yeshe Tsogyal emanation, but unfortunately we didn’t have enough merit for her to live longer. His Holiness composed the Dzang Dok Palri prayer (Copper Colored Palace of Guru Rinpoche) in her memory. Indeed, Rinpoche loved her profoundly. He often commented as to how sad he was that she did not live longer. My mother, Sangyum Rikzin Wangmo, has been the wisdom dakini manifestation who not only prolonged my father’s life but also fostered the auspicious flourishing of his wisdom revelations. I remember my father saying that his sunshine of happiness radiated when he first met my mother. I credit her with not only taking good care of His Holiness but also unceasingly encouraging his activity to benefit all parent sentient beings. As many of you know, my mother spent most of her life in strict retreat. She took a proactive role in recognizing the reincarnation of many Lamas. Her dreams were clairvoyant: they were all predictions. Before any tragedy fell on the family or others, she would foresee it and indicate methods to reverse it. We are indeed fortunate she lived for 89 years. Generally in our tradition, it is known that when a tertön leaves his body, his Dakini consort follows. She had many visions and situations where she was invited by the Dakinis to leave her body to come to their Buddhafields, but she refused, saying she still wanted to be with her children. Once again I thank her for her consideration for being with us as long as she has been. I have no doubt that she has the full power to leave her body whenever she chooses. It is now my ardent prayer that she will swiftly reincarnate and we have the good fortune to once again be in the midst of her presence. May her reincarnation be free of obstacles and may she grace and bless us soon. ↑ source: Khenpo Tsewang Dongyal, ‘Light of Fearless Indestructible Wisdom’, page 8. ↑ facebook post 29 August 2014. This page was last edited on 1 November 2018, at 15:04.